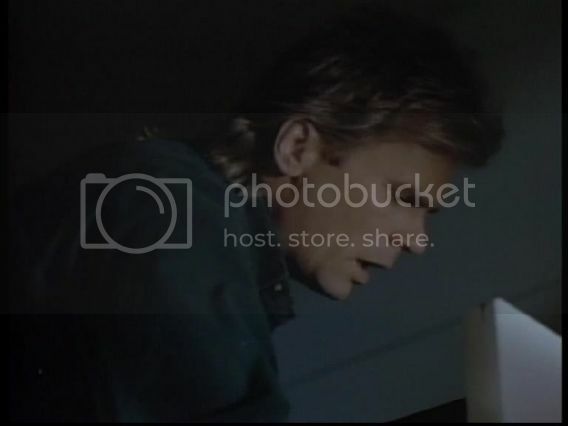 Considered that the "Guess the RDA screenshot" topic has become almost completely for Stargate, maybe we could start another one for MacGyver, same rule, the person who guessed right can post the next screenshot. The more pictures we have, the better, right? press the Print Screen button on the upper righthand of the keyboard, between Ins and Canc. Then open Paint and Paste, then resize percentage vertically to 80%, otherwise it's too big. Then click on select and select what you want, then open a new white page (you don't need to save when it asks) and paste. Then crop, then "Save as" choose JPEG. When the pic is saved in your Images, go in Tinypic.com (I'm not sure if you have to register). Click Upload, browse, choose the pic, then resize (I usually resize to 15" screen, upload and wait until you get four links. The second one is for forums, so just select it, copy and paste it here. Interesting shot, not easy. His hair looks long as in 5th season, but I don't remember that shirt in 5th season, so... is it "The human factor"? Nope Claudia, it's not 'Human Factor.' I'm sorry. Does anybody needs a little hint? Okay: it's not in the near of season 5. So.. that shirt seems the one he wore in The Escape, is it right? No, it's not 'The Escape'. Okay another hint: in one szene RDA wears nothing ... at least what you can see. I know the episode, but I don't remember the name. Is ist the one, where a probe landet and all the animals died? He searched with a white hazmet-suit for the transmitter?